Στην έκθεση της Μπολόνια, εντός έδρας, η Fiat παρουσίασε την έκδοση Bicolore για το 500αρακι της, την πρώτη από μια σειρά ειδικών εκδόσεων που θα παρουσιάσει η Fiat στους επόμενους μήνες. Πολλές λεπτομέρειες δεν έδωσε παρά μόνο ότι έχει εμπνευστεί από τα Αμερικάνικα αυτοκίνητα της δεκαετίας του 1950. Το χαρακτηρίσει η δίχρωμη βαφή, οι νέες ζάντες αλουμινίου και τα χρωμιομένα διακοσμητικά. Μηχανικά εφοδιάζεται με τον 2κύλινδρο TwinAir κινητήρα απόδοσης 85 ίππων. Φωτογραφίες και δελτίο τύπου στη συνέχεια. “The world I would like” is the concept of the Fiat stand at the Bologna Motor Show this year. Seen through the eyes of children, the Fiat area appears to be completely imagined and designed by children as confirmation of a brand projected into the future and more attentive to eco-friendliness. In this light and happy place where houses sit on clouds and a rainbow welcomes visitors to then serve as their guide in the world of Fiat, previews and new products abound, starting with this year’s star: the 85 HP TWIN-CYLINDER TwinAir engine. A true gem of technology and progenitor of a new family of twin-cylinder FPT – Fiat Powertrain Technologies engines, the small power unit uses the revolutionary MultiAir system combined with specific fluid dynamics optimised for maximum combustion efficiency. Delivering from 65 to 105 HP, it emits up to 30% less CO2 than an engine of equal performance. These results make the TwinAir a brand-new concept on the worldwide motoring scene and confirm the leadership of the Fiat Group in this field. 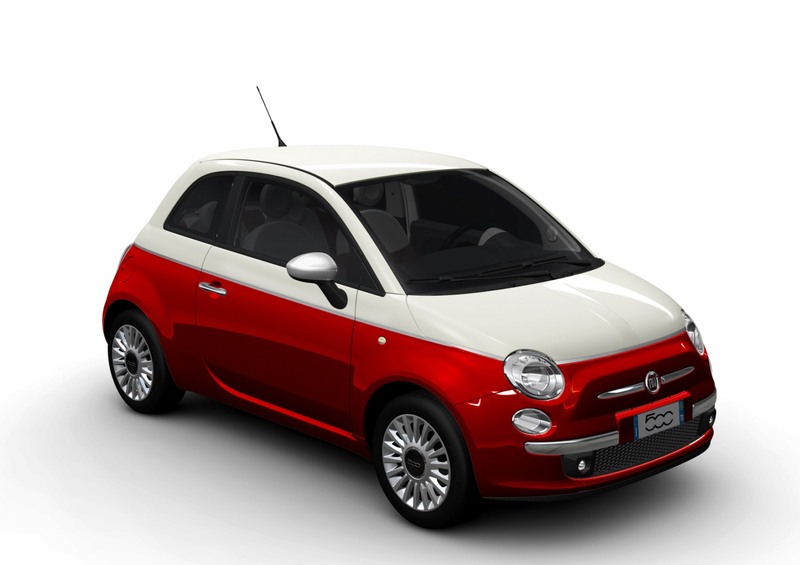 At the stand the TwinAir can be admired both on several coloured windmills to emphasise the exhilarating lightness of this compact, hi-tech, high-performing engine and on board 4 versions of the Fiat 500 on show, all equipped with Start&Stop system as standard. 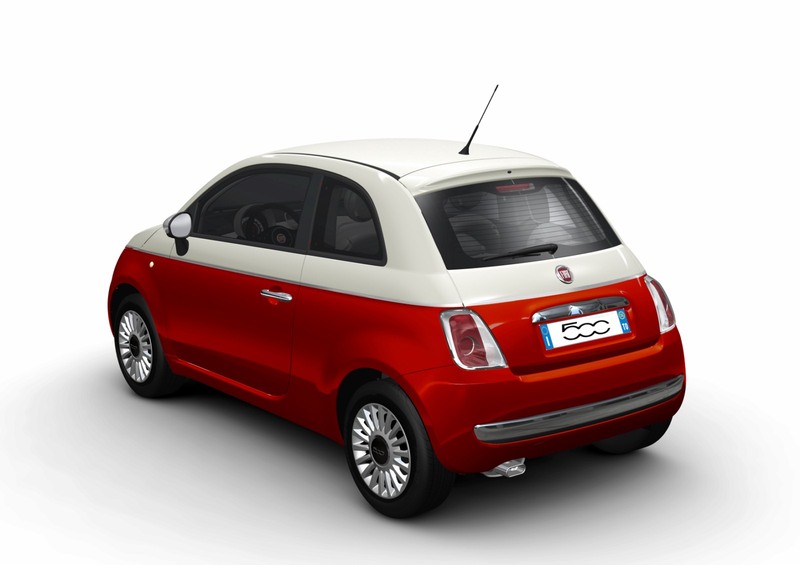 The first 500 is the brand-new TWO-TONE WHITE AND RED VERSION, an unprecedented combination that recalls the retro world of ’50s American cars and pop art. Colour is a universal language for expressing emotions and personality, and in particular for the 500 it is an integral part of a product philosophy whose constituent elements include personality, style and the widest possible array of customisation options. This is the first of a two-tone series that will be launched in the upcoming months, and that celebrates the car’s more eco-friendly and sporty spirits. The spotlights are also on another two Fiat 500 versions: a LOUNGE and a 500C BY DIESEL, the result of a joint venture by the Fiat creative team and the world-renowned Italian label. The original MATT BLACK VERSION will also take a star turn in the area, featuring an exclusive black body shade with opaque treatment enhanced by certain features in satinised chrome (whiskers, handles, mirror fairings and license plate holders), opaque black 16″ alloy wheels with hubcaps featuring a red central frame and, in the case of the 100 HP 1.4 engine version, red painted brake calipers. The same attention to detail is evident inside where the totally black environment is underscored by details in satinised chrome and silver top-stitching on the steering wheel and gear lever, seats available in red Frau leather or black, combined with the opaque black band of the dashboard. The stand features a 500 configurator like some sort of high-tech toy, where visitors can customise their own car with buckets of paint and needle and thread. The Bologna Motor Show also provides the perfect opportunity to take a close look AT THE NEW “MYLIFE” VERSION OF THE PUNTO: a 77 HP pastel white 1.4 and a 69 HP pastel red 1.2, both equipped with the Euro 5 petrol engine with Start&Stop system as standard. The Fiat Punto “MyLife” is designed for customers attentive to technological innovations, driving pleasure and environmental issues, without giving up on design, which is made even more unique by the inserts painted glossy Pianoblack that match the body colours available. And in perfect harmony with this new way of seeing the relationship between technology and ecology, the Fiat stand is displaying two show cars. The 95 HP EURO 5 FIAT QUBO 1.3 MultiJet with Start&Stop system as standard show car is distinguished by the three-coat red body colour with glossy black mouldings, grille and rims with inserts, and two special packs: Style with privacy windows, 16″ alloy wheels and longitudinal roof rack bars, and My Blue with MP3-CD Radio, leather steering wheel and knob, steering wheel controls and Blue&Me-TomTom device. The 120 HP EURO 5 FIAT BRAVO 1.6 MultiJet show car stands out in the crowd thanks to its exclusive three-coat white body combined with glossy black elements (grille, post, 17″ rims with diamond finish, rear with Bravo logo and chrome-plated exhaust tailpipe), in addition to the on-board Blue&Me system and Instant Nav satellite navigation system. The stand at Bologna underscores Fiat’s commitment in the field of environmental protection and of making drivers more aware that they should use their cars in a more responsible, eco-friendly manner. It is not by chance that Fiat has the most eco-friendly fleet in Europe. After a good three years, this leadership was confirmed also during the first six months of 2010, with an average emission value of the entire range of 123.5 g/km, more than 4 g/km less than the closest competitor. eco:DriveGP will come to a conclusion precisely at the Bologna Motor Show. It is the first eco-friendly driving competition based on objective driving data provided through eco:Drive, the innovative Fiat system which helps to increase driving efficiency, reducing fuel consumption and emissions. A unique initiative for Europe, it selected the top two eco:Drivers (one man and one woman) of each country from all of the participating owners of Fiats equipped with Blue&Me residing in Italy, France, Germany, Spain and England. And for the Motor Show, the 10 national champions have been invited to take part in the final competition to determine Europe’s most efficient, eco-friendly driver. eco:Drive represents a unique way of using technology to bring about long-term changes in driving behaviour. It is simple to use and install on a Fiat as it is a free software application that can be downloaded from the website www.fiat.com/ecoDrive. It collects the journey data through the Blue&Me interface of the car and analyses them to give the user handy personalised tips to cut travel costs and the environmental impact of his driving style. It was an immediate success. In just two years it was downloaded more than 140,000 times. Every day more than 50,000 drivers use it and about 10 million journeys have been logged and analysed on the Fiat database. Considering the contribution of the drivers of eco:Ville, the online Community of all Fiat eco:Drivers, it is possible to calculate an overall saving of approximately 3,500 tonnes of CO2. But there’s more. For the first time, thanks to eco:Drive, research on driving styles was based on a scientific, statistically representative method of analysis. And starting from 4 November the eco:Drive “WHITE PAPER”, a study on more than 400,000 trips by European Fiat eco:Drivers, is being presented in Europe in a roadshow in the major European countries. Lastly, visitors can become familiar with the products of FGA CAPITAL, a finance company (joint venture between Fiat Group Automobiles and Crédit Agricole) that specialises in the automotive segment. The company operates within Italy – with the Sava and Savarent brands – and across Europe supporting the sales of Fiat Group Automobiles and Chrysler brand vehicles by offering innovative financial complete with high added value services dedicated to the dealership network, private customers and companies.